We can say goodbye to the cold dark winter, “hurrah”, and even though we lose an hours sleep that night, the benefits of the longer brighter days ahead more than make up for it! So what impact will this clock change have on our sleep and is there anything we can do in advance to help us move seamlessly into our new time zone? We will of course not be ready for sleep at our normal bedtime and find it takes longer to get to sleep than usual. Then when the morning comes along we will be tried and groggy and not ready to get up and start the day for another whole hour. Some people’s body clocks can make the change quickly, but for others it is not so easy. 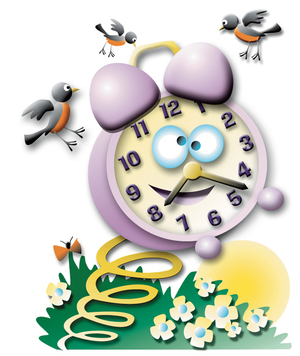 This week in the lead up to the clock change start putting your little ones to bed 15 minutes earlier. Do this slowly, shifting the time every other day. The aim is to move their body clocks so they are falling asleep an hour earlier than before. And just as importantly you will also need to wake your child 15 minutes earlier in the morning! This will help to regulate their body clock and keep your plan on course. But don’t just change the time you say goodnight to them, you will also need to move the start of their bedtime routine, nap times and just as importantly meal times. Eating and sleeping go hand in hand with regulating our circadian rhythms so it is vital you change meal times too. Give clear consistent signals to your child that bedtime is coming with a focused winding down bedtime routine that includes a short bath, a quiet story, a cuddle and then into the cot. Keep the bedroom darkened to help produce the sleep hormone melatonin and just use a small nightlight to help you prepare your child for bed. Light is the biggest influencing factor on our body clocks and directly impacts on the production of the sleep hormone melatonin, so as soon as you can in the morning get the family outside into the daylight, this will help suppress the sleep hormone and wake your little ones up. But overall rejoice the fact that we’ve seen the back of winter for the next few months! !